I’m getting a little tired of the fantasy hero whose first value is loyalty or honour. Or the supposed antihero whose dark, compromised behaviour turns out to be for some greater good. It feels like the values that once let fantasy authors make their characters different from modern people have become another over-used part of pop culture. 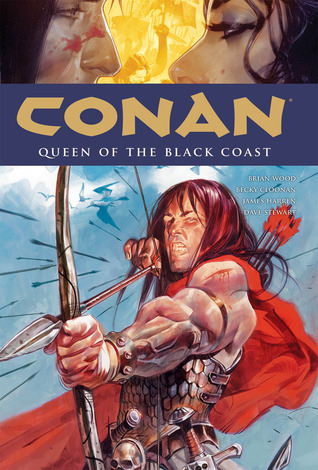 This issue really sprang out at me while reading Conan: Queen of the Black Coast, a comic collection written by Brian Wood, with art by Becky Cloonan, James Harren and Dave Stewart on colours. Wood’s an interesting writer, treading a difficult path between the expectations of a mainstream comics audience and a desire to try different things with character and story. His riff on Robert E. Howard’s classic barbarian character is no exception. The character’s values are a key part of this. There is a search for adventure in there, and a certain attachment to protecting the people on his side. But this doesn’t translate into an unswerving sense of loyalty. Conan will compromise and join the side of the people who just slaughtered all his friends. He turns pirate on the whim of circumstance. He bends others to his will for no goal beyond his own quest for adventure and self-preservation. These are not the values of a familiar fantasy hero, and realising that was like a breath of fresh air. I suddenly noticed how familiar, comforting and sometimes even stale the values were I was seeing in other fantasy novels. When it comes to character motivations, Game of Thrones is one of the better examples out there. But comparing it with this single Conan story made me realise how familiar many of the motivations are. Ned Stark is obstinate and loyal. Arya is fiercely independent and, as time goes by, increasingly bent on revenge. Stannis is guided by a clear sense of right and wrong. Joffrey’s self-serving. Tywin’s ambitious. Snow has that classic heroic sense of honour, so that even when he does something terrible it’s for a great good. There are a broad range of interesting motives at play here. They draw you into the characters in different ways. It’s very well done, and I wouldn’t change it for the world. But is any of it really new? George R R Martin is a fantasy writer at the absolute top of his game. He’s using those familiar values in new and skilful ways. Just think how many times you’ve read them elsewhere and it’s just been more of the same. I’m not saying I want every character to act like Wood’s take on Conan. As someone trying to draw in readers, using the familiar and comfortable is actually important for me. But it would be nice, both in what I write and in what I read, to push the boat out a bit further at times. To see motives and values that aren’t just different from our own but are different from what we’re used to reading. For the fantastic and unfamiliar elements of stories to go a bit deeper. What do you think? Am I being overly harsh on what’s out there? Am I missing great examples of unusual values and motives? And if you’ve read it, what do you think of Wood and Co.’s take on Conan? Writing about why I like cities as settings led me to think about some of my favourite examples. Obviously, cities play a large part in urban fantasy – the clue’s in the name – but my choices lie elsewhere. The most obvious one is Terry Pratchett‘s Ankh-Morpork. It’s a classic example of a city as a place full of the extreme and the unexpected, giving the author a massive sand pit to play in. Pratchett uses Ankh-Morpork to draw comparisons between his fantasy world and our real one, with endless metaphores for the way we live. Whatever you think of his increasing focus on these parallels, there’s no denying that they allow fantasy to comment on reality. But for me the most exciting thing about Discworld’s first city is something more than that. Over the course of many novels, Pratchett has shown us a city as a site of change, a place of accelerating social, cultural and economic upheaval. This is what cities are like, constantly shifting places which act as catalysts for wider social change, and Pratchett’s shifting focus means that his own changing interests are reflected in, and breath life into, the city. Personally, I liked Ankh-Morpork’s city watch best when they were a faltering, run-down institution failing to battle their own irrelevance, but watching their transformation has still been more interesting than if they had stood still. While Ankh-Morpork shows a city changing over time, the twin cities of Beszel and Ul Qoma, described in China Miéville‘s The City & the City, reflect divisions within a city as it stands. Miéville examines the fractured nature of urban communities, where people ignore each other in the street and different ethnic communities can exist in adjacent buildings yet barely interact. By feeding this through the fantastic machine of his mind, he creates something extreme and fascinating, exploring the absurdity and the necessity of the social conventions by which people live. The idea that two cities can exist in the same space just by ignoring each other sounds ridiculous, but Miéville makes it work, and that risk of the ridiculous makes it all the darker and more tragic, while his academic knowledge of the mechanisms of politics and society ensures a convincing extrapolation of this mad idea. Less removed from our reality than either of these, but all the more terrible for it, is Brian Wood and Riccardo Burchielli’s depiction of a war-ravaged New York in DMZ. They use the city as a microcosm for an American civil war taking place minutes into our future. The choice of New York, a place widely shown across our culture, gives it a sense of familiarity even to someone like me who has never set foot in the big apple. The use of a single city gives their story focus and heart by limiting its scale, while also allowing them to show a variety of responses to the war. While it lacks the small town intimacy of Jericho, the nearest parallel on TV, it makes real the speculative elements of the story, and brings home the reality of millions of people already living in warzones like this. There are many, many more great depictions of cities in speculative fiction. If you’re reading this, and have favourites of your own, please leave a comment – I’d love some more fantastic cities to explore.